Larry Everston Brownlee, Jr., one of six children, was born on November 24, 1972 in Youngstown, Ohio. His father, a General Motors plant worker who was also choir director at Phillips Chapel Church of God in Christ, commanded his son to perform so often that he later recalled, “I used to absolutely hate singing.” Intending to become a lawyer when he enrolled at Youngstown State University, he soon changed his major to music and transferred to Anderson University, a private Christian school near Indianapolis, Indiana, where he developed a passion for opera. A full scholarship allowed him to graduate with a master’s degree from the Indiana University Jacobs School of Music in 2001, the same year that he won the prestigious Metropolitan Opera National Council Auditions, and, in the summer, he participated in the Young Artist Program at the Wolf Trap Opera Company in Vienna, Virginia. 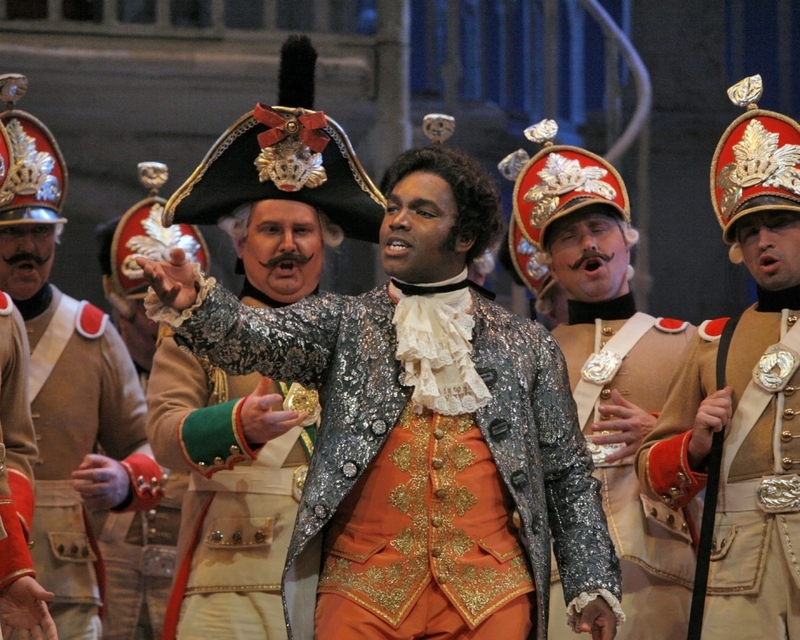 In 2002, Brownlee, a tenor, first performed what would become his signature operatic role—that of wealthy Count Almaviva, the successful suitor of the beautiful Rosina in The Barber of Seville—at the Virginia Opera in Norfolk, Virginia, performed in Porgy and Bess with the New York Philharmonic, sang in Bach’s Magnificat with the Cincinnati Symphony, and made his debut at the world-renowned La Scala (Teatro alla Scala) in Milan, Italy, starring in Rossini’s L’italiana in Algeri. Over the next decade, he appeared in, among others, Handel’s Messiah (Houston Symphony) and Israel in Egypt (Cleveland Symphony); Lorin Maazel’s 1984 (Covent Garden, London); Donizetti’s La fille du regiment (Hamburg State Opera, Germany); Mozart’s Mass in C Minor (Chicago Symphony); Carl Orff’s Carmina Burana (Boston Symphony at Tanglewood and Carnegie Hall, New York City); and in concerts and recitals in Paris and Toulouse, France; Tokyo, Japan; Berlin, Munich, and Dresden in Germany; Vienna, Austria; and Zurich and Geneva, Switzerland. He also performed in Philadelphia (Pennsylvania), Detroit (Michigan), San Francisco (California), Atlanta (Georgia), Seattle (Washington), and Washington, D.C.
CD releases featuring Brownlee include his Songs/Lieder/Melodies (EMI Classics, 2006), The Heart That Flutters (Opus Arte, 2013), and Spiritual Sketches (EMI, 2013); contributions to Rossini operas Il Barbiere di Siviglia (Sony, 2008), Armida (Decca, 2010), L’italiana in Algeri (Naxos, 2010), Stabat Mater (EMI Classics, 2011); Maazel’s 1984 (Decca, 2009); and Giovanni Mayr’s Medea in Corinto (Oehms, 2010). He can also be heard and seen on stage in DVD recordings of La Cenerentola and Stabat Mater. A life member of Kappa Alpha Psi Fraternity Inc., in his spare time Brownlee enjoys photography, salsa dancing, and roots for the Boston (Massachusetts) Celtics and Pittsburgh Steelers. He lives in Atlanta, Georgia with his wife and two children.